Rome by Night! A worldwide unique Tour, the opportunity to admire the Eternal City and its secrets cradled by the fountains lullaby. It’s when the sun sets, the best time to feel Rome. It’s when the dark comes, that such a millenary spot opens the curtains on its Secrets. 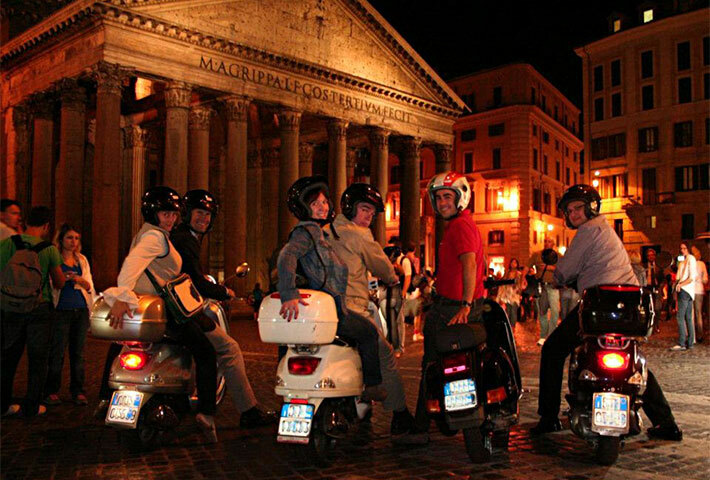 It’s the night when, the Rome statues can finally whisper us their stories Rome by Night is the experience! You’ll be picked up in your stay to be led trough a lifetime two wheels ride. Along the several stops of the Tour you’ll be introduced to the fascinating history behind how Rome came to be. It’ll be like living the ages of the ancient capital of the world under the stars. The Colosseum and its mute ancient uproar, the majesty of Michelangelo’s dome in Vatican, the deafening water harmony of the Trevi Fountain, are only some of the highlights of a once in the life experience. Vespa, Fiat500, Calessino or Bike?